Use for Pump connections or siphon drain hose. Discounts in 50’ increments. Better grade tubing than found in home centers/hardware stores, heavier wall thickness. 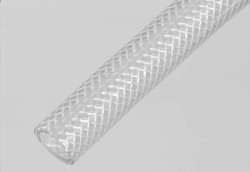 Clear flexible vinyl tubing with polyester braided reinforcement. Smooth inner and outer walls. Will accept barbed internal fittings and hose clamps on smooth exterior surface. Makes good fill hose for aquariums using tapwater pressure. Easy coiling, light weight yet can handle higher pressures than standard clear vinyl. a flexible vinyl tubing with crush resistant spiral construction - not corrugated. Will accept barbed internal fittings on smooth interior wall and hose clamps on smooth exterior surface. Central System Drip Tubing: see fittings and accessories on Air Accessories page and Plastic parts page. Exterior ribbing (except 1/2” size) provides crush resistance, smooth inner wall allows use with barb fittings for easy connection to pumps, drain lines, aquarium bulkhead fittings. Black color prevents algae growth. Typically used underwater for feeding diffusers - remains sunken while connected to air supply unlike regular vinyl tubing. Use regular vinyl or PVC pipe from air pump to water’s edge, then convert to weighted tubing for underwater portion of run.